Quantum superposition is one of the most difficult concepts to understand in all physics. It lies at the heart of what makes quantum mechanics so counter intuitive. I find myself always saying things like “It is in both states at the same time, until you look at it, and then it is only one thing.”, which sounds like pure hocus-pocus. It is not. I plan to have a mathematical description of quantum superposition, but decided for now to start with a simple analogy. A quantum state is a mathematical representation of a physical property. The act of determining the physical property is called a measurement, that is, “looking” at the state to determine what it is. Quantum mechanics allows for a simple mathematical way to describe both the state, and the outcome of the measurement. The price for this mathematical simplicity is a conceptual inconsistency in the physical description of the object. Thus, the quantum state can have two incompatible physical properties simultaneously, while when the state is actually measured, only one of them physical properties is measured, either one, it is determined by chance. Now, the analogy. I cannot stress enough how this is an analogy, a mnemonic device if you will. This is not the full story of what quantum superposition is, just something to wet your appetite. Think of the quantum state as a wireframe cube, that is, a simple drawing of a cube in paper, like the cube on the left side of the image. The cube on the left is a 2D representation of a 3D object. Our brain can interpret it in different ways, incompatible with each other, as shown in the right side of the diagram. The cube on the left side is not really a cube at all! It is just a 2D representation of a 3D object. However, our brain likes to interpret it as a 3D object, a real thing. The drawings on the right serve as suggestions of possible ways our brain could interpret the 2D image. For example, we could imagine it as a box, I decided to put a little pig on top of it. You can see how a box like is perfectly consistent with the 2D image on the left. Likewise, the 2D image could be seen as a corner, like the corner of a room. 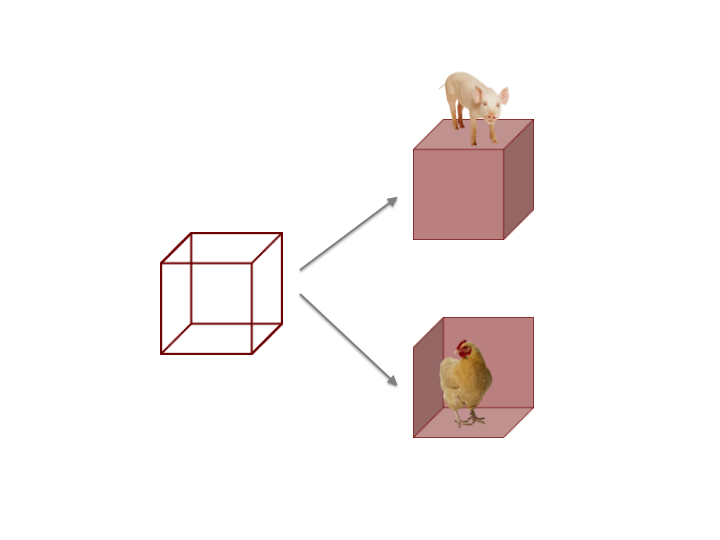 I used a chicken to help you visualize this interpretation, that is also consistent with the 2D image. However, altough the diagram with the pig and the one with the chicken are both compatible with the 2D wireframe, they are incompatible with each other! Your brain can visualize the 2D wireframe as a Box, or as a Corner, maybe even switch between both visualizations, but not have them both at the same time. The analogy is complete now. The 2D image is the quantum states, in a sense it can be said to contain many choices of 3D visualizations within it. A quantum measurement is then analogous to the limitations our brain demand of the image following the laws of perspective. Only one interpretation at a time is allowed by the brain, just like the quantum state can show only one physical property of the two incompatible physical properties at a time. The analogy breaks in several ways, I’ll point one. Although our brain has some control of the 3D image it decides to see out of the 2D object, there is no such control in quantum superposition. The measured physical property that is seen is chosen at random from the incompatible options. Quantum superposition does not in any way mean that our brain gets to chose what physical reality is, but it does stresses the fundamental probabilistic nature of reality. Remember, superposition means that two incompatible properties can exist simultaneously, without any inconsistency.